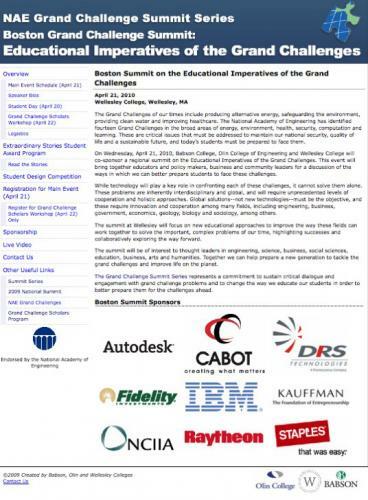 On Wednesday, April 21, 2010, Babson College, Olin College of Engineering and Wellesley College co-sponsored a regional summit on the Educational Imperatives of the Grand Challenges. This event brought together educators and policy makers, business and community leaders for a discussion of the ways in which we can better prepare students to face these challenges. While technology will play a key role in confronting each of these challenges, it cannot solve them alone. These problems are inherently interdisciplinary and global, and will require unprecedented levels of cooperation and holistic approaches. Global solutions--not new technologies--must be the objective, and these require innovation and cooperation among many fields, including engineering, business, government, economics, geology, biology and sociology, among others. The summit at Wellesley focused on new educational approaches to improve the way these fields can work together to solve the important, complex problems of our time, highlighting successes and collaboratively exploring the way forward.